Made in Japan, Zig Watercolors employ high-quality, lightfast pigments that stay bright and brilliant for extended lengths of time. Pigments are ground to a consistent size, eliminating diffused light reflections that can dull color brilliance. All pans measure approximately 1¾"Dia. 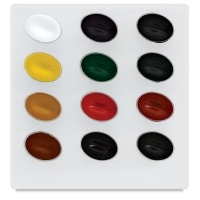 Transparent Set of 12 — Brown, Yellow Ochre, Lemon Yellow, White, Violet, Vermilion, Grass Green, Blue, Black, Carmine Red, Deep Green, and Prussian Blue. 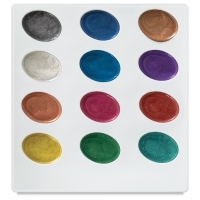 Pearlescent Set of 12 — Gold, Coral, Pearl, Black Pearl, Emerald, Pink Diamond, Sapphire, Lapis Lazuli, Turquoise, Ruby, Amethyst, and Copper.